Enter to win 1 of 10 Early Copies of Side by Side! The time has come... for my very first giveaway of advance copies of Side by Side, which releases officially on June 5, 2018! 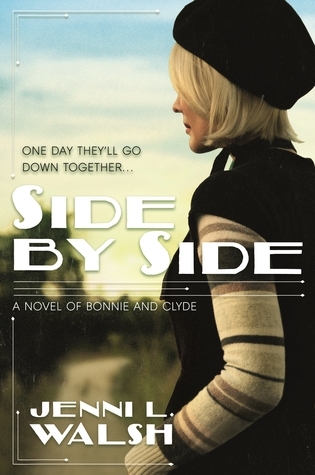 Side by Side is the story of America’s most infamous crime spree told in the raw and honest voice of the woman who lived it, Bonnie Parker. Enter through Goodreads by clicking below, and good luck! Giveaway ends January 07, 2018. Side by Side Has a Cover! It's always so exciting to see your book baby get a face and I'm so excited to share the cover of Side by Side! The cover and title is inspired by Bonnie Parker's own words, from her poem The Trail's End. And without further ado... the cover!! And in more exciting news, the forthcoming paperback edition of Becoming Bonnie got a facelift to match! What ya think? Beauties, right? Both are available for preorder here, with Side by Side releasing June 5, 2018 and the paperback of Becoming Bonnie coming May 8, 2018! Being Bonnie is now Side By Side! The title for my next book has gone through quite the transformation. It began as Being Bonnie, the sequel to Becoming Bonnie (Book 1). And while Book 2 is still a sequel, it's very much a book that can stand on its own (without first having read Becoming Bonnie). but it's death for Bonnie and Clyde." I hope you're getting excited! I sure am, especially for seeing the final cover (coming soon)! This'll be my third year mentoring, and I'm so excited to get this party started. I'm a mama of two and a book mama of one, with three on the way. I'm published with Macmillan, under their Tor/Forge imprint. My novel, Becoming Bonnie, is the coming-of-age origin story of how wholesome Bonnelyn Parker becomes half of the infamous Bonnie and Clyde duo during the 1920s. Next year, the companion novel Side by Side will be hitting shelves, telling the duo's crime spree story. I'll also be beginning a narrative nonfiction series, called She Dared, with Scholastic for middle graders. As a mentor, I believe I can bring some experience to the table as far as working with editors and publishers, along with agents. I am repped by Stacey Glick of Dystel, Goderich & Bourret. Also, if you want to get an idea of how I became agented and received my offer of publication, I wrote about it over on Writer's Digest (as you'll see, I'm a real believer in Pitch Wars). I'd also love for you to get an idea of my writing style. If you hop on over to Amazon and click "Look Inside" on the cover, you can preview the first chapter or so. This year for PItch Wars, I'm narrowing my wish list considerably. I'm looking for... adult historical fiction. That's it. If you've got it, I want to see it. Books that I get grabby hands over have a high-level concept (i.e. premises that are easily explained) that I simply have no choice but to see how the author brought it to life. Here's a few examples of books that recently had me itching to read. In Girl In Disguise, the book features the first female Pinkerton detective who foils a plan to assassinate Abraham Lincoln (in addition to other undercover roles). In The Orphan's Tale, a young girl becomes a circus performer to hide her identity during WWII. In Salt to the Sea, the novel is inspired by a little-known, but true tragedy. ​I encourage you to show me in your pitch that your book is high-concept. I don't need your manuscript to be perfect, but I'd like to know you put in the time to prepare for Pitch Wars. That shows me you're ready to work. Your solid writing skills will also give me confidence that you'll be able to expertly implement feedback. My friend Google has tons of checklists/tips for ways to tighten and improve technical writing, so I'd recommend giving those a gander before the submission window opens. Basically, dangle your killer concept and your awesome writing skills in my face, and, if chosen as my mentee, together we can work through any plot-related and character-related improvements. What questions do ya have for me? Don't be shy, just give me a shout @jennilwalsh or leave me a comment! Disclaimer: I know this is vague, but my interests in historical fiction are vast. I literally choose books by covers (which you obviously don't have yet) and a great premise. What keeps me turning the page is great writing (hence my two points above). Also, please consider donating while applying. I won't see a penny of it (nor should I; I'm contributing my time/energy to an awesome cause: your career). Likewise, Brenda and her admins won't profit from your donation. Your hard-earned money will go toward offsetting the high financial and time-related costs of running this amazing contest. Thank you to Shelf Awareness for the kind words and review of Becoming Bonnie! Jenni L. Walsh imagines the story of the quintessential good girl turned gangster's moll in her debut novel, Becoming Bonnie. Bonnelyn Parker has always been a straight-A student and a straight-arrow girl. Since her daddy died, she's toiled extra hard to help her mama around the house while working nights and weekends at a local diner. But times are tight in Prohibition-era Dallas, and when Bonnelyn loses her diner job, she's not sure how her family will make ends meet. Her rebellious best friend Blanche drags her along to Doc's, a local speakeasy that might have jobs for them both, and Bonnelyn starts down a different path--one that will change both her life and name. Bonnelyn's first-person voice is distinctive and charming: she's bookish, plainspoken and fiercely loyal to her family and to Roy Thornton, the boy she's loved since they were little. But she has dreams of her own, and they include more than scraping by. "This here is the twenties," she says. "Women can vote; women are equals, wanting to make a name for themselves." Bonnelyn is unsettled but seduced by the free-and-easy atmosphere of Doc's and the tip money that begins to ease her family's financial burdens. As her new life (complete with an appealing new boy, Clyde) barrels toward her old one on a collision course, Bonnelyn must decide what name she wants to make for herself. Walsh's rollicking narrative will have readers rooting for Bonnelyn-turned-Bonnie every (dance) step of the way. Discover: Jenni L. Walsh's debut novel brings to life the woman who became one half of gunslinging duo Bonnie and Clyde. See the review on Shelf Awareness here.